Is Samsung actually planning to surprise us all by providing a third major update to an existing phone? North American carrier T-Mobile definitely seems to be working with the Korean giant on making that possible, as its support pages say that Oreo is coming to the Galaxy S6, Galaxy S6 edge, Galaxy S6 edge+, and Galaxy Note 5. Since these are official carrier support pages, they are easier to believe than Samsung’s usually off-the-mark support reps, who had given us hope a few months ago about the Galaxy S6 possibly not ending its life cycle on Android 7.0 Nougat. Galaxy S6, S6 edge, S6 edge+ and Note 5 Oreo update on the cards? 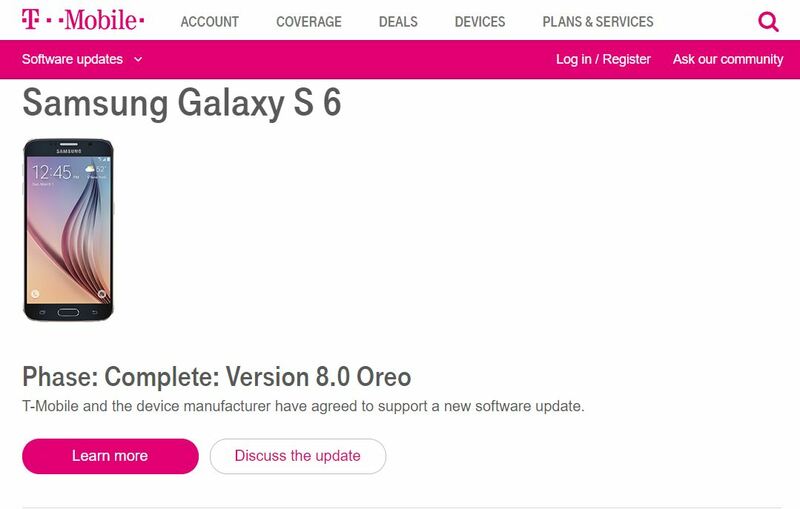 The support page for each device says that “T-Mobile and the device manufacturer have agreed to support a new software update.” Also written in big bold font is “Phase: Complete: Version 8.0 Oreo.” It could mean that basic development on Oreo for these devices has been completed and that the ball’s now in T-Mobile’s court to work on carrier certifications. That’s certainly possible as even Oreo for the Galaxy S7 edge was released in a usable state just ahead of the Galaxy S8 Oreo update. Since the software on the 2015 flagships and the Galaxy S7 lineup is very similar, getting Oreo up and running on all these phones probably won’t take much time, either. But, as always, it’s better to be skeptical instead of getting your hopes up, until we get further confirmation about Samsung’s plans to extend software support to its flagship phones to three years. With the mid-range Galaxy A series phones getting two major updates for the last couple of years, upping the support game for the Galaxy S and Galaxy Note lineups would be a logical move. You never know with Samsung, though, so it’s best not to get too excited just yet. Que venha o Oreo para o Galaxy s6 Samsung nos agradecemos. I’d be happy if my galaxy A510FD gets at least 8.0I just want the Samsung experience 8.5 with the updated icons. I won’t hold my breath for the Singapore market, since Samsung has already been disregarding us in terms of the frequency of updates. S6 Edge+ received a second Nougat update a few months ago inserting that missing BLF, but the normal S6 (and for that matter probably the Edge too) still has yet to get an update since its oh-so-late release in October 2017.
anyone have idea when c9 pro will get oreo update? I wouldn’t get too excited about this yet. Should wait for official confirmation from Samsung. The one rationale behind them doing this is the loss of the Note7. Many Note users holding on to or who went back to the Note5 would deserve an extra upgrade. It’s not fair for other phones like s5 who stuck at 5.0 and get only 2 “major” upgrades. S5 and Note4 had more to do with its SoC, and another smaller part was Samsung’s decision to maintain the same UX since its release, so it does look the same, but running on Marshmallow. The SoC’s limitation meant dead-end for its lifecycle, since Nougat’s requirements are either Vulkan or OpenGL ES 3.1. I’d be happy if my Note 5 gets at least 7.1.1. I just want the Samsung experience 8.5 with the updated icons. Moi aussi. Quelqu’un qui peut nous aider !! I’d still wouldn’t hold my breath. I mean for example, back then ,didn’t they have on their site that they were working on a Lollipop update on Note 2 and it ended up never coming out and they acted like they never said they were working on it? People seem to forget very easily. You understand that people, who bought flagship devices paid more, right? It would not be unfair for them to get 3 major updates with 2 for the A series and say 1 for the J series. You pay more – you get more. That’s how it works. This is awesome. I don’t have my S6 edge anymore but for those that do, its great news. Might have to wait a little longer but still. So S7 Edge will get 9.0 in the future. Thats means the A 2016 Series become also ar Android 8 Oreo Update! I don’t think so, as they are not flagship devices. Not even S6 is confirmed officially to get Oreo yet, but even if it was, I highly doubt they’d step up the game for A series as well. A 2015 series ended with Marshmallow so it’s probably going to be another 3-4 years at least before mid-range phones start getting 3-year support (and that’s if high-end ones start right now). I think the A 2016 Series get the update because the Android 8 Oreo was released in the 2 year update-time. And they get the update because a supporter from Samsung said to me that the device get it. Ich denke, die A 2016 Series bekommt das Update, weil das Android 8 Oreo in der 2-jährigen Update-Zeit veröffentlicht wurde. Und sie bekommen das Update, weil ein Supporter von Samsung mir gesagt hat, dass das Gerät es bekommt. These online supporters give people often false information. UTVIC99 is right. It is very difficult for a flagship device to get a third major update. The A series is more unlikely. If they do, they receive up to two updates, as well. Samsung doesn’t even have time for that. They have a lot of mid-range phones to design and much software to build. Only two major updates. 2 years = security updates. No. Because A(6) series is not a flagship serie.